Xenophon, his spouse Mary and their sons Arkadios and John, were noted citizens of Constantinople and lived in the fifth century. Despite riches and position, they distinguished themselves by their simplicity of soul and goodness of heart. Wishing to give their sons John and Arkadios a more complete education, they sent them off to the Phoenician city of Beirut. Through Divine Providence the ship on which both brothers sailed became ship-wrecked. The brothers were pitched by the waves onto shore at different places. Aggrieved at being separated, the brothers dedicated themselves to God and accepted monasticism. For a long time the parents received no news about their children and presumed them to have perished. 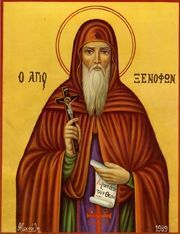 Xenophon, however, now already quite old, maintained firm hope in the Lord and consoled his wife Mary, telling her not to sorrow but to believe that their children were watched over by the Lord. After several years the spouses made pilgrimage to the Holy places and at Jerusalem they met their sons, pursuing asceticism at different monasteries. The joyful parents gave thanks to the Lord for providently re-uniting the whole family. For the remainder of their lives, the monastics Xenophon and Mary dedicated themselves to God and accepted monasticism. The monks Arkadios and John, having taken leave of their parents, went out into the wilderness, where after long ascetic toil they were glorified by gifts of wonderworking and perspicacity. The monastic elders Xenophon and Maria, having pursued asceticism in silence and strict fasting, also received of God the gift of wonderworking. This page was last edited on October 24, 2012, at 18:59.